From MissouriNet: Missouri’s right to work law passed by state lawmakers and signed by Governor Greitens in February has effectively been suspended. The statute which would have normally taken hold Monday has been delayed by union efforts to have it go to a public vote. 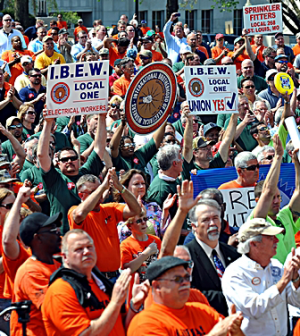 The labor organizations met a deadline to present required petition signatures to the secretary of state’s office for the law to be placed on the ballot. It won’t be known if there’s a sufficient number of valid signatures until the secretary of state completes tabulations of the petitions and announces results in early February. It’s generally assumed the union are in good shape since they submitted more than three times the required number of signatures for verification. The public vote being sought is known as a ballot referendum, which has taken place 26 times since 1914, the last time in 1982. The issue at that time was whether maximum weight and length of large trucks would be increased. The law was rejected by voters. The secretary of state’s office provided Missourinet with an electronic image of a 1982 newspaper story which reported that then Secretary of State James Kirkpatrick had determined the truck law was suspended after petition signatures were filed.